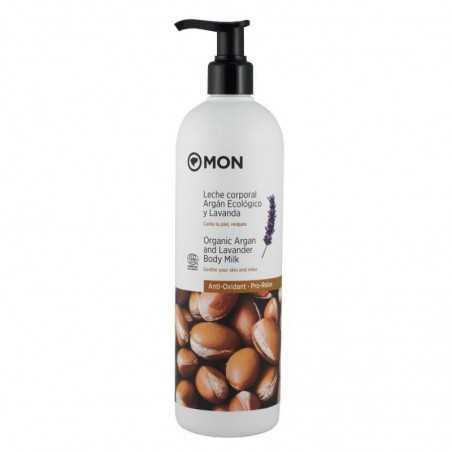 Argan and Lavender body milk, moisturizing, regenerating and relaxing, with Ecocert certificate. Soothes, nourishes and moisturizes the skin while relaxing the mind and body. Science and pleasure, tradition and innovation. With Argan and Sesame oil, enriched with Aloe Vera, Vegetable Glycerin, Karite Butter, and Lavender, Orange and Tangerine essential oils. Apply after bath to moisturize, regenerate and soothe skin. Aqua (Water), Ammonium Lauryl Sulfate, Aloe Barbadensis Leaf Extract (Aloe Barbadensis Leaf Juice), Glycerin, Cocamidopropyl Betaine, Caprylyl / Capryl Glocoside, Ascorbyl Palmitate, Argania Spinosa Kernel Oil, Tocopherol, Lecithin, Lavandula Angustifolia (Lavender) Oil, Citrus Reticulata Peel Oil, Citrus Sinensis (Orange) Peel Oil Expressed, Glyceryl Oleate, Coco-glucoside, Potassium Hydroxide, Hydrogenated Palm Glycerides Citrate, Sodium Chloride, Benzoic Acid, Potassium Sorbate, Citric Acid, Sodium Benzoate, Linalool, Limonene. 98.29% of the total ingredients are of natural origin. 86.22% of the total plant ingredients are biological. 5.01% of the total ingredients come from organic farming.